THE KING'S YOUTH: Revisiting Spirituality (Part 2): Don't YOLO it; YOLTBTSTYLF it! Revisiting Spirituality (Part 2): Don't YOLO it; YOLTBTSTYLF it! As a brief recap, spirituality is a very misunderstood term, one misunderstood as ridiculous; either as a tool to become holy, or as an 'airy-fairy' false belief system people resort to (see part 1 here). Christianity is also amongst the crossfire: as some perceive Christianity as religiosity; something that has strict requirements to follow in order to become 'holy'. Recently I have been reflecting on YOLO (you only live once). I love this term, you know, it kinda feels like the 'push' or 'kick starter' before a bungee jump. I often use it if I'm not sure about doing something, and 95% of the time it gets me to do a particular thing without looking at its consequences. But the idea behind YOLO can distort how I live with God in a world that is 'fun'. One thing about Christianity is that we do not indeed to strive for God's promise. You may have heard this time to time, and I indeed forget it time to time, but one of the many major things that differs Christianity from other faiths like Islam, is their promises. We are made with, raised with and saved through Christ - all are in past tense! For many religions it is 'follow, strive, invest and then, become holy', but for Christianity we who accept Jesus as Lord are 'holy', therefore it is the other way round; we want to 'follow, strive and invest'. So for Christianity, we have are inheritence now, and later. The now being our assurance! 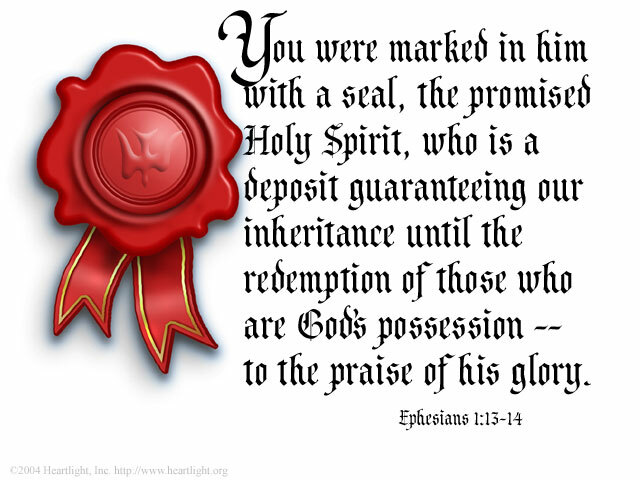 The Spirit is our assurance (see image; Eph 1: 13-14), God gave us not something, but someone to look after us until we are in heaven. In part 1 (see here), I referred to the fruits of the Spirit: essentially, the desires of the Spirit which overwrite our darker desires; nurturing our spirituality. But also, God gave us his Spirit to dwell in us to remind us of his promise, eternal life - salvation. Recently I have been pondering how this has huge significance on our day-to-day lives. You know, it is weird, when the bible refers to Christians as 'saints' and 'righteous'. Because in the world we live in it is so easy to compare ourselves with others and feel insecure. I don't know about you but I don't look in the mirror and go 'look at this beautiful saint!' You know, righteousness is alot more down to earth than you may think. Essentially, it describes a person who is right with God (through accepting Jesus Christ as lord); living in and by his promise. But this idea of righteousness is so distorted, moreover, it is - for everyone; non-Christians, Christians, old age society and post-modern society - often limited to a 'great' man like Moses or an old dude who has dedicated his whole life to a religion in a run down chapel. But it isn't an earned thing, it doesn't put people on a higher pedestal in a 'hierarchy' in order to get closer to God (see Eph 2: 9). It is this misunderstanding that managed to translate itself into how I perceive the life I live and its many choices. I read Romans 8 recently, and never have I been so challenged! It describes the promise we have not just later, but now! Even more so, it provokes my spirit with joy to reach out to the world. Cause if I have an eternal life after this one then YOLTBTSTYLF! You Only Live Twice But The Second Time Is For Life, so why not? Imagine you are in heaven 3000 years from now, you would probably be like 'remember that time 3000 years ago when I was scared to talk to that guy about this eternal life?' Oh yeah, imagine I also said this in a joyous tone of voice - as Jesus' promise isn't a conviction to reach out to people, but a fire, a reason, something that gets us pumped to do it! Don't feel compelled to force yourself to talk to strangers, but simply, if someone asks about your faith or asks what you are up to in the weekend - just YOLTBTSTYLF it - tell them you went to Church, tell them about your testimony, Jesus says to plant seeds not to tear roots (Matt 13: 29). They may laugh or persecute you, but in a millennia or so you'll be like #YOLTBTSTYLF that! When we spend time with the Spirit, our fruits develop in which it reflects a healthy spirituality. Moreover, when our fruits develop, when we feel secure in our relationship with the Spirit - no matter if we read our bible everyday or not, sinned that day or not - it develops an eternal perspective. I write this as an encouragement! Because isn't it awesome that God didn't just give us a piece of paper saying we are saved? That instead, he actually gave us a living person to assure us of his promise, a person to develop a relationship with and count on! So don't YOLO it - I might aswell do this cause I'll die; YOLTBTSTYLF it! this is really good :) LOVE that song!!!!!!!!!!! !